Great page - the little semiquavers are perfect! And I love joining in the singing too. Perfect page for your lovely traditions. This is exactly the color palette I chose for my December Daily minibook! LOVE how yours turned out! 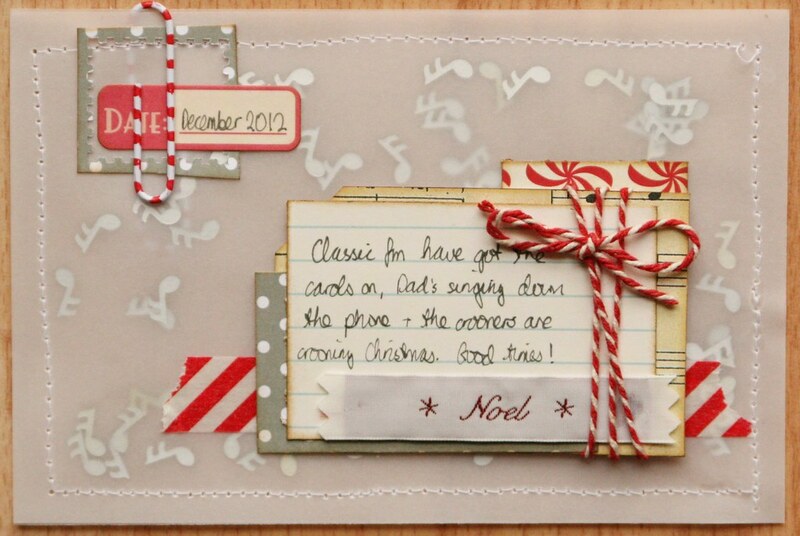 The twine and vellum envelope with the music notes inside are such GREAT details! Sweet story as well- you guys sound like really fun to be around during the holidays. I love the thought of you all gathered round the phone singing, making up bits along the way. I have a penchant for singing my own words to familiar tunes, totally made up things, but hadn't realised how often I did it until I was in the kitchen cooking dinner the other evening. The dog was in the room with me and my daughter and husband were in the lounge. I got to the quiet bit between choruses and I heard my daughter ask 'Is she singing to that dog again?' And why wouldn't I? She's the only audience that doesn't groan when I get started!